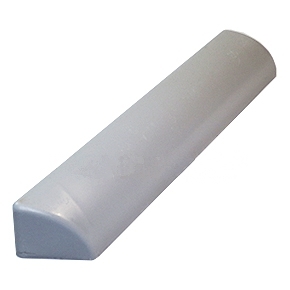 PRODUCT: Chemcurb 12-inch Straight Piece, Solid Polyester-Urethane. (F1303P). Price/Each. APPLICATION: ChemCurb 12" straight pieces are used with corners and 1/2 rounds to create custom shaped curbs with a 2-inch deep poured rubber seal. A curb is bonded to the roof surface (EPDM, PVC, BUR, coal tar, SBS mod bit, granulated APP, many types of coated metal, metal flashing details and FRP), creating a form for the rubber seal and protecting it from ice or mechanical damage. Curb components are made of precast polyester structural urethane and can be configured to fit every shape and size of penetration. Chemcurb F1305P 2 inch Corner Curbs. 8 Curbs/Box. Price/Box.